The Hudson Valley Center for Contemporary Art (HVCCA) is excited to announce a new exhibition, “Women Warriors,” opening October 15th at 5pm. “Women Warriors” honors the 100th anniversary of women’s suffrage in America, as well as the continuing fight for equal rights in the public sphere. A voting booth will be created by artist Isis Kenney in conjunction with ArtsWestchester’s “Give Us The Vote” exhibition. 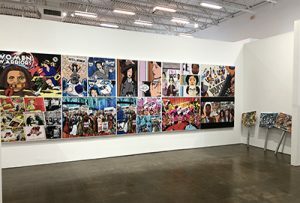 Kenney is creating four large panels depicting “women warriors” such as Susan B. Anthony, Sojourner Truth, and Adelina OteroWarren as comic book superheroes fighting for the common cause of human rights. The work of Cey Adams, celebrated muralist, designer, and artist will also be on display with his culture-laden American flags. Both Kenney and Adams utilize the visual language of Hip-Hop in their work to create bold, colloquial images that speak to the essence of what it is to be an American citizen and warrior.